My wife is an evil person. She starts watching shows on Netflix and then she gets me hooked. Once I am invested in the show, I have to watch the whole thing. 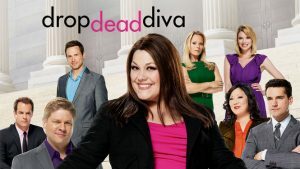 So, we are burning our way through Drop Dead Diva. This TV show has one of the goofiest premises that I have ever heard of in my entire life but… it works and it is completely entertaining. The concept is that a model, Deb, dies in a car wreck. At the same time, a lawyer, Jane, passes away and Deb’s soul goes to inhabit Jane’s body. Not making this up. This is the real plot device behind this show. Again, it works and you learn to embrace it and you learn to love it. Your suspension of disbelief happens really quickly and you just start to really dig the world that the story takes place in. The cast brings their A-game to a show that I am sure seemed unlikely from time to time. Deb vs Jane – The dual personality between Jane and Deb plays well from episode to episode. Deb is in Jane but there are parts of Jane that surface from time to time. Jane’s intellect, her brain, and her legal knowledge are all still there but underneath it all is Deb’s bubbly personality – Deb’s high spirits. Add to this the fact that Deb was dating a lawyer in the same law firm as Jane and the already muddy waters just gets muddier. Parker – Josh Stamberg plays Jay Parker, the managing partner of the law firm that all these legalistas work at. He is my favorite character in the show. Much like my love of Roger Sterling in Mad Men, Jay Parker is that combination of HR nightmare, empathy and womanizer that you get to watch grow up during the course of the show. Unlike Roger Sterling, Jay Parker is a much better person and therefore you enjoy watching him grow up a lot more. Especially because he actually seems to learn from his mistakes. Margaret Cho – Holy crap, do I love Margaret Cho! She is an amazing comedian and she is equally as great as Jane’s quirky, resourceful assistant. Margaret Cho is perfect. I refuse to say a whole lot more. My vocabulary for how wonderful she is in this role does not suffice. She needs a spin off. I hate to call this a guilty pleasure show for me, but it is. This seems like one of those shows that I would never have watched if not for my wonderful wife. This is not something I would have ever chosen to watch on my own and at times, I really don’t believe that I am watching it. All of that being said, I really am enjoying the show and will be sad like I usually am when we are done binge-watching all six seasons.